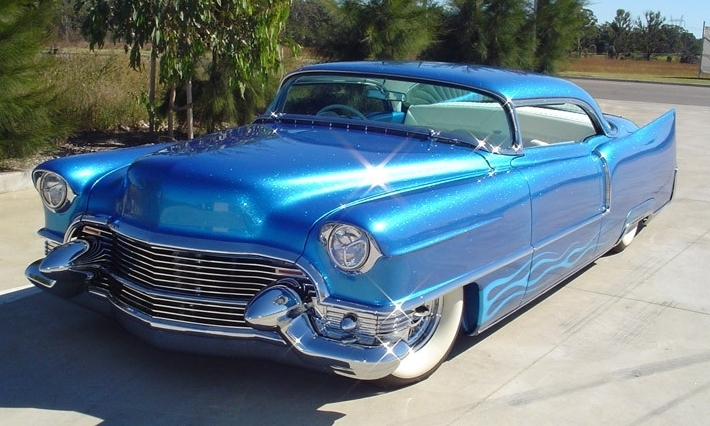 Before ‘Wild Cad’ came along, Mario Colalillo built this stunning ’55 Caddy dubbed ‘King Cad’. Like all of the creations built by the Colalillo family, its a lesson in style and taste. Featuring a healthy chop, acres of metalflake, pristine chrome and trim to die for, it is hands down one of the sweetest customs ever built in Australia. I’m pretty sure it also holds the distinction of being the first Street Machine cover car with whitewalls! And whats more it could be yours, check out the details here. When you consider the number of hours getting a car to this standard, and the expense in things like the chopped screens, the paint and the chrome, the buying price is pretty damn good. Here’s hoping she goes to a good home! Actually here’s hoping my lotto numbers come through! King Cad was at Harry’s Cafe De Wheels on Saturday night, I’d have loved to have checked it out up close again, but it was pulling out as I was pulling in – doh!